Raspberry Linzer Tarts are one of our favorite holiday treats and are made with two buttery cookies filled with tart raspberry preserves. 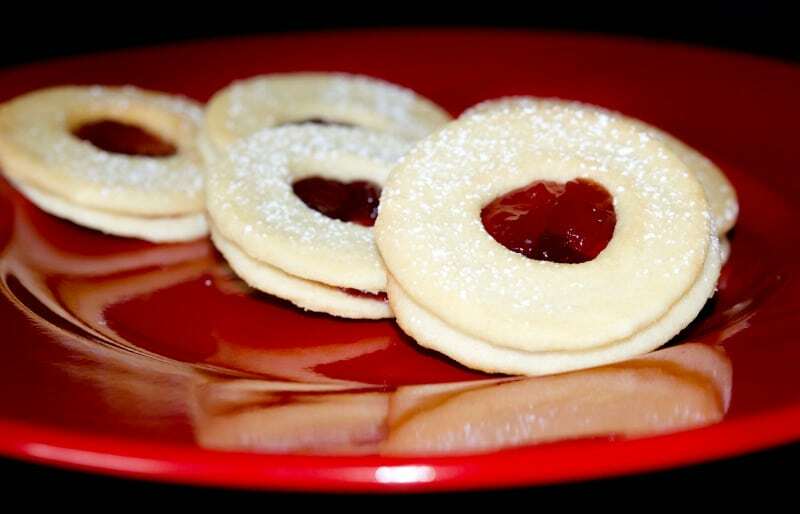 I’m starting to do some baking for the holidays so I figured I’d start with my husband’s favorite – Raspberry Linzer Tarts. The first time we had these cookies was at my Mom’s house. She had been making them for years, but we hadn’t been to FL where she lives for Christmas until last year (she usually comes up north or goes on vacation). 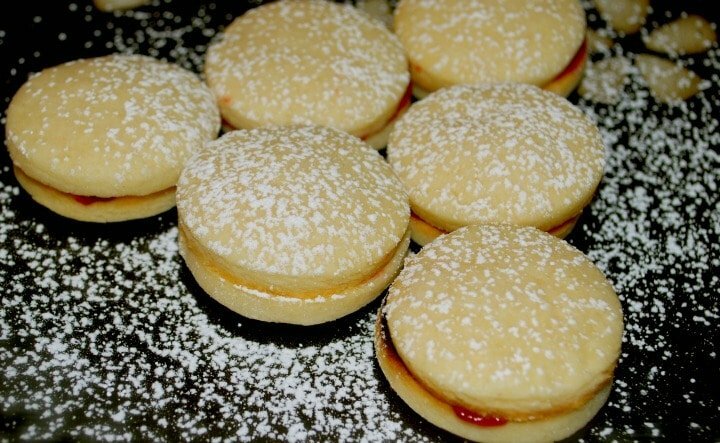 She put these tarts out and they were an instant hit! Someone also recently asked me how the cookies will stay fresh until Christmas. I freeze them in resealable freezer bags. They’ll stay fresh for a good month or so but I usually only keep them in there until I need them for company or for the holiday itself. If you need to make a platter of cookies, simply pull some out and they will defrost in no time. I love these Raspberry Linzer Tarts, but not all of the calories. So instead of adding the circle cut outs back into the dough to be rerolled, I make mini cookies for myself. This way I can have one or two and not feel so bad. ~Enjoy! 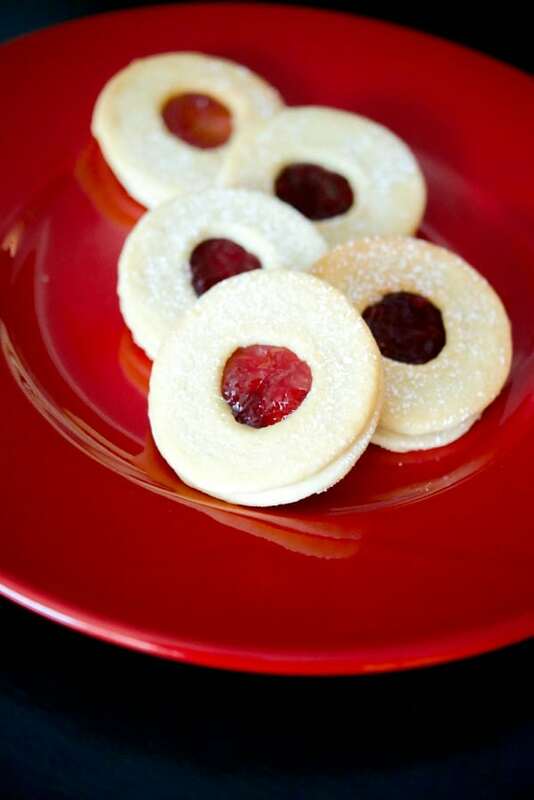 Raspberry Linzer Tarts are one of our favorite holiday treats made with two buttery cookies with tart raspberry preserves spread on the inside. Cream together the butter and sugar until well combined; then add the vanilla. Next, add the flour and mix well; then place the dough onto a floured surface and shape into a flat disc. Chill in the refrigerator for 30 minutes. Remove the dough and roll out to 1/4" thick; then cut out two 3/4" rounds. Cut out a hole from one of the circles (I use a juice glass and a shot glass to cut out the center). 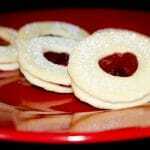 Place all of the cookies on an ungreased baking sheet or on parchment paper. Bake for 20-25 minutes or until the edges begin to brown. 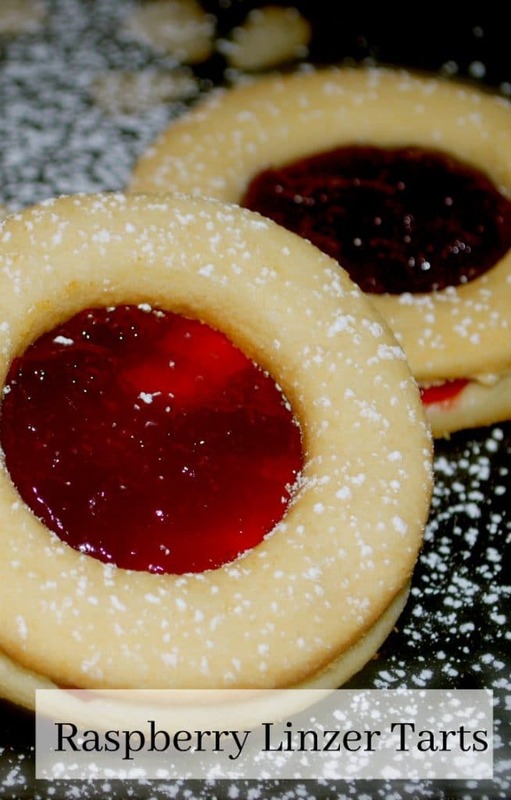 Allow to cool slightly; then spread some preserves on the full round cookie and top with the cut out cookie. Cool completely and dust with confectioners sugar. These are absolutely gorgeous! I worked in two different tearooms over a span of 10 years and we made the heart shaped ones 😉 Delicious! Beautiful job, Carrie! These cookies look soooooooo good!